Pikes Peak, called America’s Mountain for its summit’s role inspiring Katharine Lee Bates to pen “America the Beautiful,” is one of the most popular Colorado Springs attractions. Visitors to the area have several options for experiencing the iconic 14,115-foot peak’s soaring heights, from a drive up its windy (but safe!) highway to a ride on the cog railway, hikes up its trails and frame-worthy views from nearby Garden of the Gods. What will you see at the top? Forever! Alpine views stretch out in all directions to encompass reservoirs, summits of shorter peaks, clouds, the Continental Divide, Garden of the Gods, the cities of Woodland Park, Manitou Springs and Colorado Springs. On a very clear day, you might even glimpse Denver’s skyscrapers, the Great Plains stretching to Kansas and the Sangre de Cristo mountain range stretching toward New Mexico. Located on the way to the top, Summit House welcomes visitors with a gift shop, snacks (including famous donuts), sandwiches, salads, coffee and more. Fifteen miles from Colorado Springs on Hwy. 24, you’ll travel 19 miles past the North Pole Home of Santa’s Workshop Amusement Park, a handful of reservoirs, Glen Cove Inn, picnic areas, visitors centers, scenic overlooks and interpretive areas and peekaboo moments with Pikes Peak itself. Tolls for the highway range from $4 to $40 depending on the season and number of passengers in your vehicle. Round trip is a roughly three-hour excursion. Find more details about the highway at pikespeakcolorado.com. * Note: Due to limited parking at the summit due to construction of the Pikes Peak Summit Complex, visitors planning to drive to the top during the busy summer months (May through October) may be required to take a complimentary shuttle from designated parking lots along the highway. Cycling the highway is also an option for the extremely hardy rider. Find regulations and safety tips. Worried about the uphill climb? Opt for a trip with an outfitter like Bike Pikes Peak, who will shuttle you and your bike (or provide you with one) to the top of the summit so you can enjoy the easy 7,000-foot descent. The most popular route for climbing to the summit is Barr Trail, a 13-mile trek with a gain of 8,000 feet in elevation that starts in Manitou Springs. Its length, high altitude, many switchbacks and unpredictable weather in any season mean only experienced and well-prepared hikers (warm clothing, plenty of water and food) should attempt the full route to the summit. Find information on this and other trails up Pikes Peak. Since 1916, super-skilled competitors from around the world have gathered to race from Mile 7 on the Pikes Peak Highway to the fourteener’s summit for the Broadmoor Pikes Peak International Hill Climb. Spectators gather to watch the racers on the historic 12.42-mile track, which climbs more than 4,500 feet and includes 156 turns (June 30, 2019). 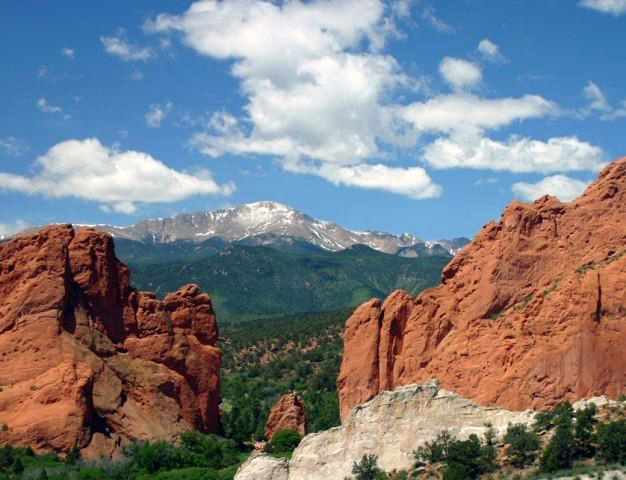 Find other attractions in Colorado Springs and Pikes Peak Country. Read more about What are 14ers?